Productive Much? Let’s Share What’s Working – Part IV: The Virtual Notebook | Do I Look Like A Writer in This? This is the fourth and final post in a 4-part series on the tech tools I’m using to help me be more productive. Most productivity blogs will compare two applications that store and organize your content, allowing you to add notes and share information easily. Both use the metaphor of a “virtual notebook.” These are Evernote and One Note. Both are accessible as desktop programs (Mac and PC), web-based apps and mobile apps. I used to use one and now I use the other. Evernote is the one I used to use. It’s great at grabbing and organizing content of any kind. It also lets you write notes. It has great tagging and search capabilities. But for me it doesn’t lend itself as well to project management. One Note does it better. One Note is a Microsoft Office product. For a long time it sat on my work computer until one day I decided to investigate it. Now I use it for a ton of things–taking notes at meetings and events, taking notes on what I’m reading, and organizing projects. I even drafted these productivity blog posts in One Note. What I like most about One Note is the way it’s set up. Like Evernote, there’s a notebook paradigm, but One Note really takes this idea to heart. Like the looseleaf notebooks you’d buy for school, each One Note notebook has tabbed sections and pages. You can even create sub-pages. This is my notebook on everything book-related. The tabs at the top are sections of the notebook. The first section consists of notes I took at the Golden Crown Literary Conference last year. Each page of the section (listed on the right) includes notes from a session I attended. The photo shows my notes from a session on writing historical fiction. If I want to share any notes (i.e., a page) with a friend or colleague, I can easily do that via email. In addition to organizing your note taking, One Note lets you insert pictures, photos and screenshots. You can also insert entire files of any type and store them on a page of related content. You can also create a table in One Note. I’m using One Note to manage a big project at work where I need to organize a lot of information and have it in one place. I will say that one limitation of One Note is that because it’s a Microsoft product the Mac version of the desktop app is not as robust as the PC version, but overall it’s a great application for managing a lot of information and keeping it accessible. For any of the tools I’ve discussed to work well, you have to use The Most Important Tool–your brain. There’s a lot you can tag to do or read later, but then later catches up with you. So using Pocket to read what you’ve saved, keeping up with your Feedly subscriptions so they don’t overwhelm you (I go through my Feedly feed every morning), and getting back to those emails you’ve labeled *To Do is what really make these systems work. I hope these posts have been helpful. Maybe one thing resonated with you and will help you? Please, please, please let me know. And if you have other/better ideas, let me (and everyone) know as well. I’ve long been curious about One Note. It’s a good looking program. I know you use Scrivener — I’m using it now too but I had wondered if One Note would work for novels. 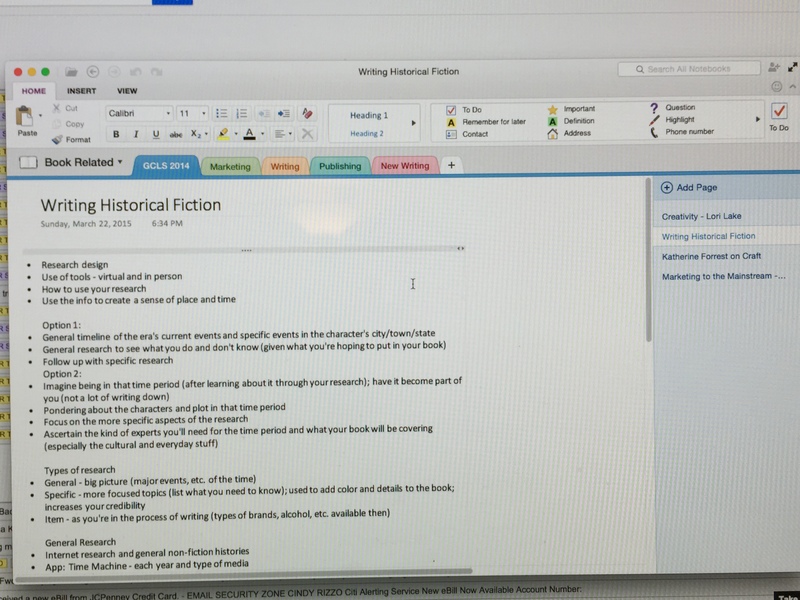 One Note could do some of the things that Scrivener does – store and organize research, let you write each scene or chapter separately. The thing it lacks is the ability to compile each of the scenes into one Word document. I’m not even sure how that could work in One Note. For my first book, I used Word and OneNote. I loved the ease of doing a screen clipping in OneNote. I also used it for the Writing Academy. During the online lectures I could quickly do a screen clip of the powerpoint being discussed. For the second book I started out with Scrivener but have since returned to the old standby. I get myself behind when I file too many things away to be done later. I like the concept of prioritizing, doing what needs to be done immediately, and then moving on. Another important point the class made was to keep a clean inbox. In this electronic day and age, I know I can get overwhelmed with all the information needing to be saved. Thank you for sharing your methods. Jove Belle is Here…with Cake! My reviews on Lesbian Fiction and sometimes a few others tossed in.